A young couple, Celestial and Roy are living the American Dream. Roy is a young executive and his new bride Celestial is an artist on the brink of an exciting career. Roy observes, “all my life I have been helped by leg up programs – Head Start when I was five and Upward Bound all the way through. If I ever have kids, they will be able to pedal through life without training wheels, but I like to give credit where it is due”. You read these lines in the very first chapter and you feel incredibly proud of what American has achieved. Acknowledging the incredible progress America has made, Roy observes, “if you’re going to be black and struggling, the United States is probably the best place to do it”. Roy was determined to live out his American dream as up and coming, hungry young black professional, reaching for the stars, but never forgetting his roots. He says, “but with my mother and Celestial, I was actually split down the middle. Olive (his mother) brought me into this world and trained me up to be the man I recognized as myself. But Celestial was the portal to the rest of my life, the shiny door to the next level”. Although he came from the deep South, Roy felt that the American dream was in his grasp. Little did he know that the America that brought him Head Start and Upward Bound, still retained in the recesses of the deep unconscious, strong biases that can splinter young lives. It seems in America, being black means never forgetting your race. As Kamau Bell once said, “being black means the exact same thing in the current era as it meant throughout the history of this country, that at any point a white person can harass you for no good reason, and you kind of would have to take it”. The unfounded optimism about how far the country has come in eliminating racial prejudices, sometimes takes young black people by surprise. Unguarded and trusting, they fall prey, first to people’s biases, false eyewitnesses and testimonies, and later to society’s complex legal system. Held for days and weeks without a trial, without the help of appropriate legal attorney to navigate the complicated legal labrinth, it impacts entire families for generations. Roy and Celestial’s young lives are soon shattered when Roy is accused, arrested and sentenced to a crime he did not commit. Roy slept behind bars one hundred nights before he was even brought to trial and was then sentenced for twelve years. But Roy and Celestial had faith. Celestial says, “maybe that’s what innocence is, having no way to predict the pain of the future”. Getting arrested and getting sentenced unjustly, was not even half of the pain they would go through as they navigate through life; one a free bird with all kinds of new opportunities for the taking, and other behind bars, suffocating as if life is slowly being snuffed out of him. What happens to the love that formed the center of their existence, now finding expression in soul baring letters? Celestial writes, “a marriage is more than your heart, it’s your life. And we are not sharing ours”. Celestial is outside in the real world where sharing a life looks very different than it does to Roy, who is inside. Roy and Celestial’s journey touches our souls. Tayari Jones is a master storyteller. She lays bare before the readers, the simplicity of the young couple’s pain. And at the same time, her compassionate observations of the complex characters in the story, make their pain even more searing, even more real. First, there are hard questions about injustice and betrayal, a man’s responsibilities and demands of parents’ eternal love. Then there are heartbreaking complex softer issues like, who defines the propriety of our responsibilities and desires, and what does one do with wounds that may never heal. 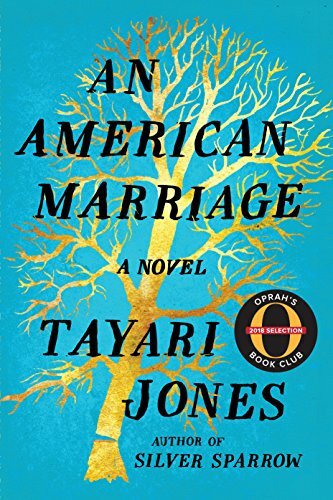 American Marriage may not provide the answers, but this book will hold your attention, make you marvel at the richness of the language and from time to time, will stir your soul at some deep level where truth is….. just truth and humanity is humanity, regardless of race, class or color. I would like to make one final point about unjust imprisonment and in 2018, all the emphasis that is being put on “law and order” but comparatively much less so on compassion, understanding and humanity. To address problems thus will continue to keep our society splintered and lives shattered, including black lives, lives of those seeking asylum, lives of children who cannot speak for themselves, lives of LGBTQ community that are often marginalized. Problems cannot disappear because children are taken away and put in cages or refugee families put in military detention centers or young black men taken away and put behind bars or young couples are not allowed to cement their love because they are of the same gender. Problems cannot disappear because people are made to disappear, left dead, broken or marginalized. That patriarchal solution treats the symptoms, giving a false sense of security. I hope we start thinking about it more wholistically and offer systemic solutions that are also compassionate and humane. One can’t underscore the importance of effective leadership at national level, to bring this dialog at the forefront in a constructive way, with less divisive rhetoric and with appeal for broad engagement towards more compassionate systemic solutions along with heightened individual awareness. This entry was posted on July 4, 2018, 12:21 pm and is filed under Book Reviews. You can follow any responses to this entry through RSS 2.0. You can leave a response, or trackback from your own site.